and buy them ASAP before they are all gone too! Happy Shopping! 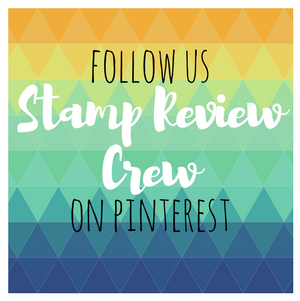 And remind those hubbies out there that Stampin Up! stuff makes the best gifts! Ok, so I live in a family of pack rats, I'll just tell you this right up front. Even my kids are pack rats. I am trying to be a pack rat in recovery, lol! So yesterday when I was cleaning in our great room (which doubles as a stamping room, rec room, and living room), I found a box of business sized and personal letter sized envies my 16 y/o son brought home from a yard sale he was helping at. These envies didn't sell, probably because they were all sealed shut from the humidity at some point! Useless right? I can through them away, right? 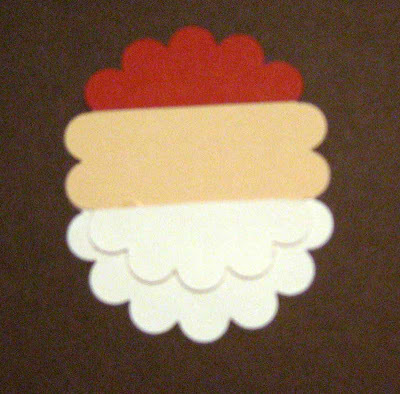 Nope, I remembered that I could use the business sized ones for the Cocoa cards and not even have the lick the yucky glue to seal them before cutting them up! Ok, so I can throw the small envies now. Nope! 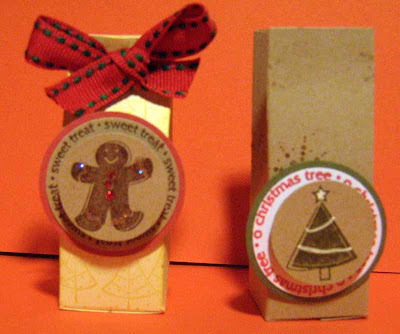 Brilliance strikes and I figure I can make little cocoa cards for tea packets. Well, I had to sit down and make some almost right away and guess what. 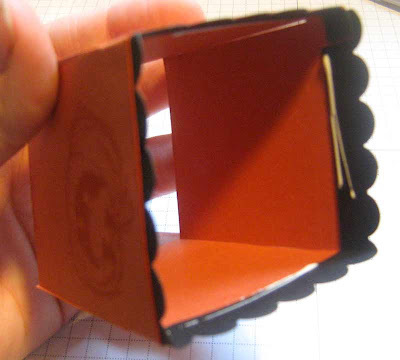 You can fit wallet sized photos, gift cards, money, and/or a little note in these things! So cute! Here it is with a packet of tea and a couple of wallet sized pics of my daughter in her Junior ROTC uniform from a couple years ago. 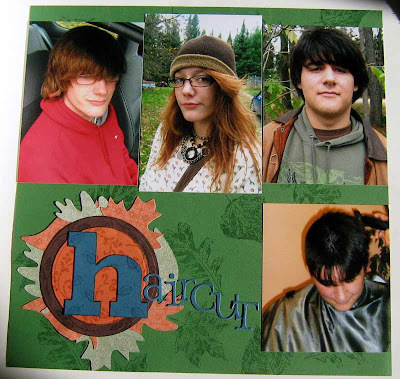 Yes, my totally hippie daughter was once in Junior ROTC and actually considered joining the military. 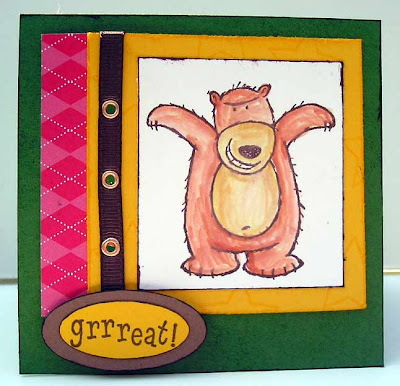 :) I did a video tutorial for the Cocoa card here. 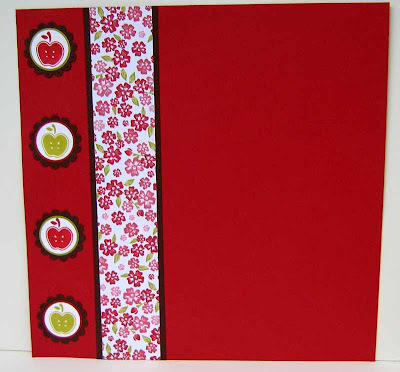 Accessories: Riding Hood Red ribbon, Aquapainter, paper crimper, stapler. 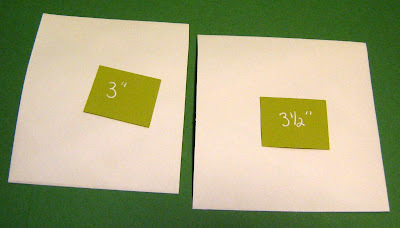 First cut your envelope into 2 pieces, one 3" long and the other 3-1/2" inches long. The longer piece will fit into the shorter piece. 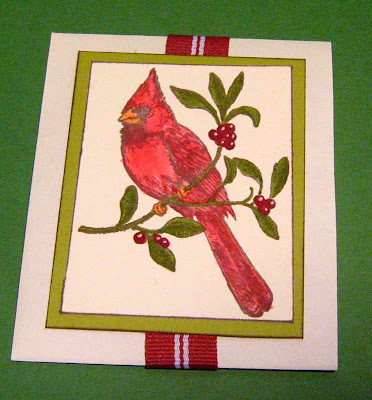 For the card "front" (the shorter piece)I watercolored the image with Ruby Red classic ink, and then on this one I used the Old Olive and Real Red markers to color the branches and berries. I did a different one watercoloring the branches with Old Olive and I liked that effect better. I highlighted the berries with a dot of white gel pen. Inked the edges of the image pieces with Basic Brown. 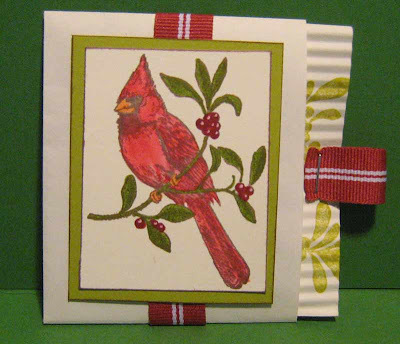 Adhered the ribbon all the way around with Tape Runner, then adhered image to card. 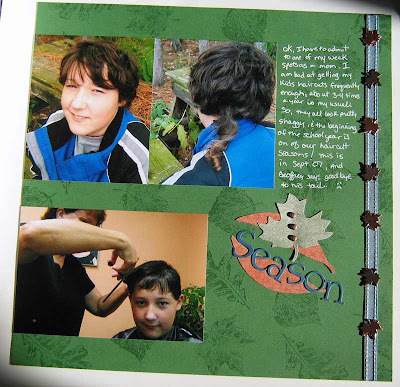 Now, I stamped the branch shadow image in Kiwi Kiss repeatedly on front and back of the longer piece. Run piece trough paper crimper. Take an approx. 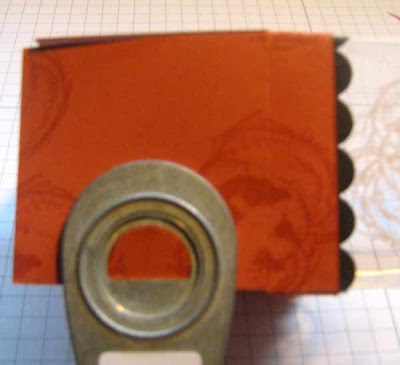 2" long piece of ribbon, fold in half over closed end of piece, and staple it on. 20-50% OFF THESE FABULOUS BUNDLES! This is a wonderful opportunity so don't lose out! This sale is only on for 6 days and it is while supplies last, so if you see something you want, let me know right away by email boser@paulbunyan.net , or go to my official Stampin Up! site and place an order now! 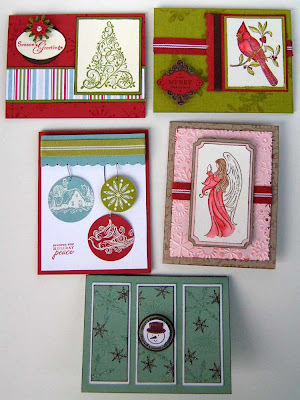 Stampin Up! is having a Black Friday Sale Nov 26 thru Dec 1st! We will find out the details on this sale tomorrow and I can't wait! Who doesn't love a great sale and at a great time of year. I will post the details here as soon as they are available :) Then, if you would like to take advantage of this fabulous sale, you can go to my Stampin Up! website and order quickly and easily on line and have it shipped directly to your home. Or you can contact me and I will put the order in for you. Ok, here I am trying to do this video tutorial thing again! Well, today was our Stamp Club meeting and Thanksgiving is definitely the theme! 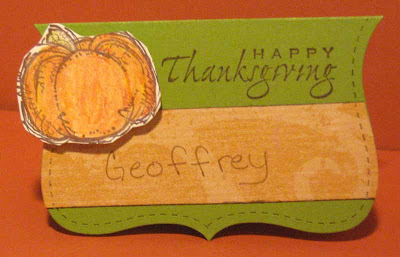 We did a little turkey I saw here originally by JHWorksforstamps on SCS, he is such a cute little guy! 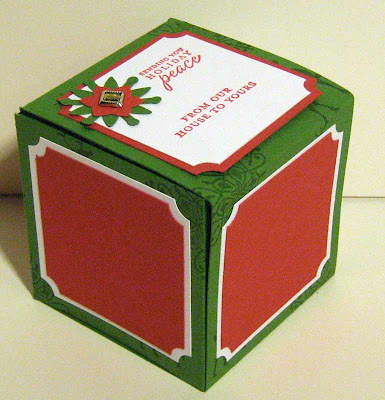 We also did a place card for the table using the Top Note die for the Big Shot, a scrapbook page for Thanksgiving, and a little Christmas pocket card to get the juices flowing for next month. The Special this month is on all of the Rub-Ons: spend $20 and you can buy any and all of the Rub-Ons for 20% off! There sure are alot of cute rub-ons in the Mini and in the catty this year! 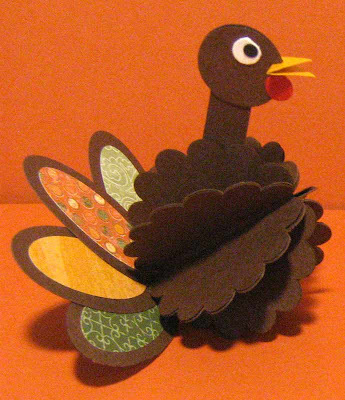 This is our cute little turkey, and there are no stamps used in this project! It's all done with punches! 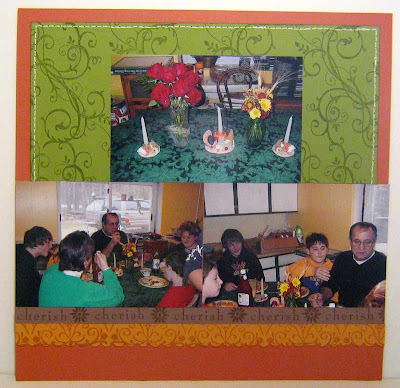 And the Thanksgiving layout. These pictures are from 4 years ago, can you believe it! 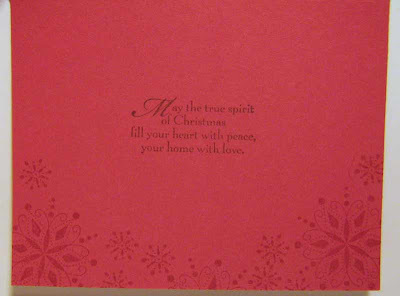 And this is the Cocoa card, very cozy looking isn't it! Now, I'm working on doing some video tutorials, if I can get my camera to record for more than 3 mionutes at a time! Wish me luck! I think this will end up being in 3 parts though. Well, it is that time of year and everyone is getting into the spirit! 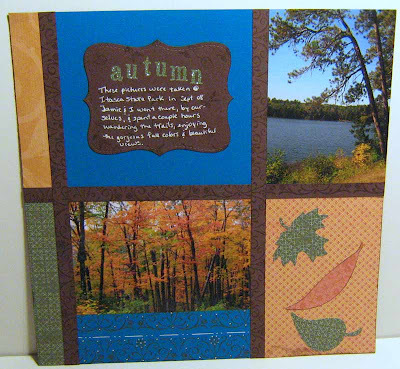 I have put together a card making class for November 15th from 1:00-5:00pm at the Quilted Loon in Bemidji. 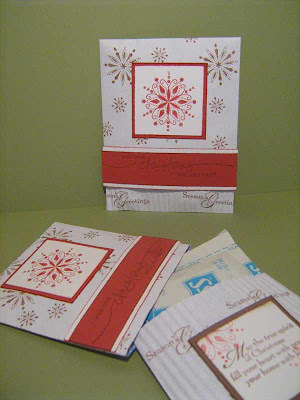 Each card kit will be enough supplies for 3 each of these 5 designs and will cost $25. 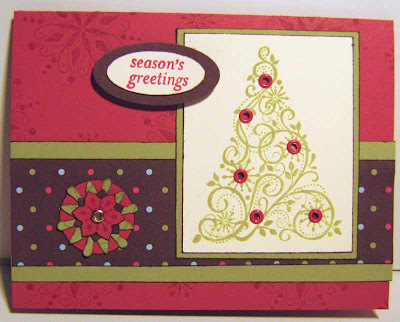 I will have everything at the class for stamping and embellishing your cards. Sounds fun doesn't it! 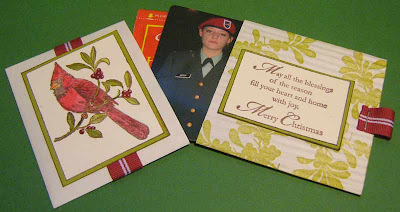 These are the cards we will be making, except for the pink angel I guess. I have been told that pink is not very Christmassy and since these are for others to make and give away, I should really listen to that advise huh, lol! So we will make this blue angel instead. 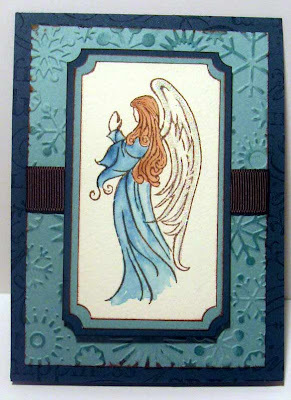 You can't really tell in these pics, but there is glitter on the angel's wings, on the snowflakes on the snowman card, and on the house, dove, and snowflake on the "balls" card as Mary calls it, lol! We will be able to add some colored glitter to the the Swirled tree also, if you would like. Come join me for a very productive and fun Saturday afternoon. Tell me what you think and leave a comment! 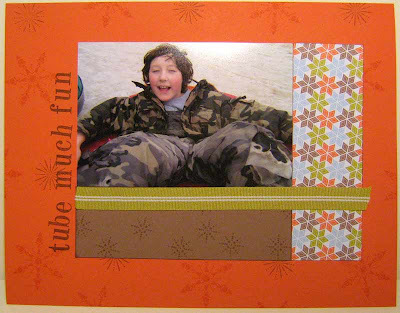 This is one of the Layouts I did this weekend. I wish I had thought to take some pictures of everyone else's stuff, that would have been fun to see! One our friends is also the one who cut the kids hair that time, say cheese Audrey! Here it is as promised! Sorry the photos are a little fuzzy, I tried to get up too close. 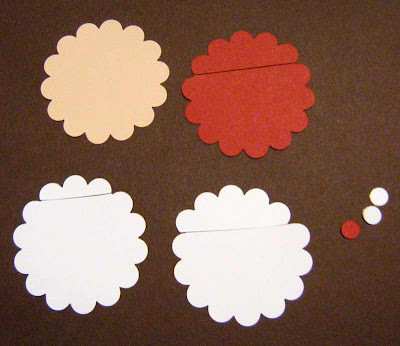 and 2 white and 1 red standard hole punches. Leave the Blush Blossom whole. 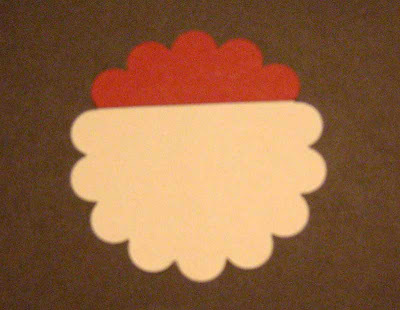 Glue the 5 scallop white piece on the bottom of the Blush circle. 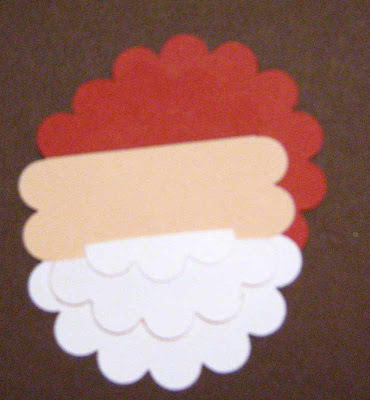 Glue the 9 scallop white piece on the back of your Santa to the scallops just above the previous white piece. 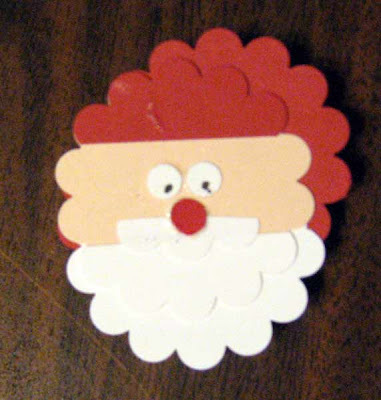 Glue mustache on front of Santa just above the front white piece as shown. 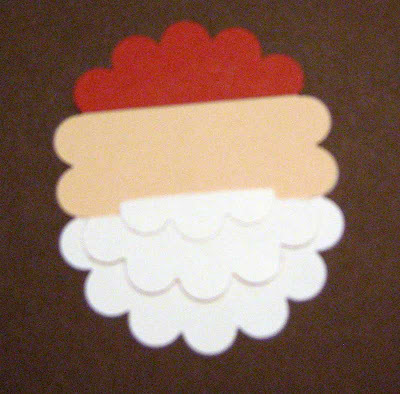 Glue the 9 scallop red piece on the back of the Santa with its first scallop behind the 2nd red scallop on the front so part of it extends past the face, forming the hat. 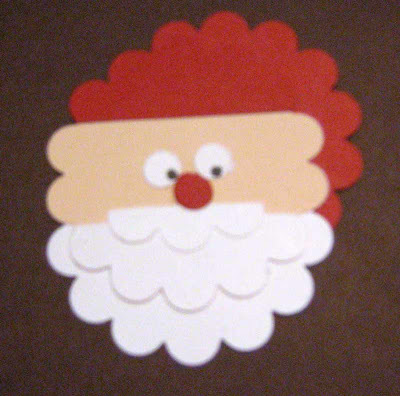 Add the standard hole punches as the eyes and nose, then use marker to add the eyeballs. All done! 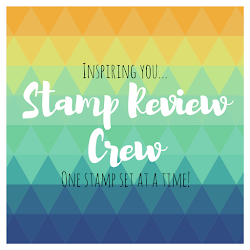 For those of you who missed the Stamp Club meeting this weekend, I thought I would hurry up and post the projects :) I only had 2 projects figured out before the retreat started, then planned one when it was just Heather and I. Then I was at such a loss, I asked for requests! We'll start with the one I put together while talking to Heather, but actually planned while driving home from Walmart that morning when the weather was so gorgeous! I just got the Watercolor Wonder Crayons, and I am in love! I love how rich the color is with these things! This is one of the projects I had prepared ahead. Autumn/Fall is my favorite season. I just love everything about it. I wish it lasted longer! 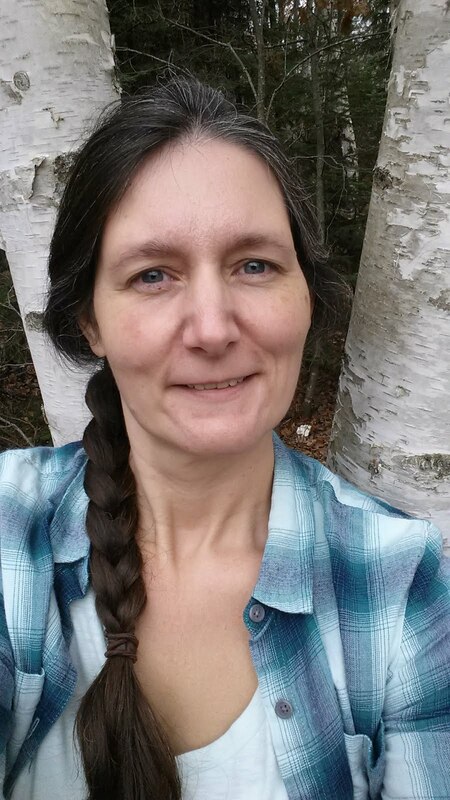 I know we all have great photos from the Fall time, and there are so many great things we get together with family for in this season. This is the page by request! 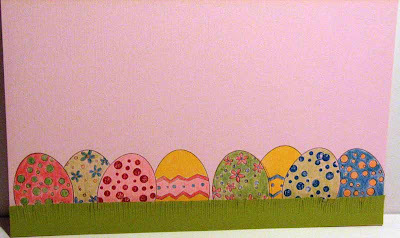 When I asked what theme of page they wanted, they said "Easter!" So we got to use the Watercolor Wonder Crayons again! Look at how bright those eggs are! And this little guy is something I madeup quick when Mary Strand said "boy, these spiders are sure cute, but do you think you could make a Santa like this?" Cute huh?! I have decided that I will just stamp for fun this week, and worry about planning the next Stamp Club meeting stuff until later. I got some new Christmas stuff recently and I haven't really played with it yet. 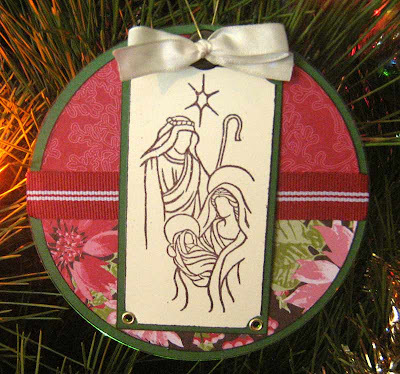 I wanted to try this set with colorful eyelets as tree ornaments, and I think it turned out well. 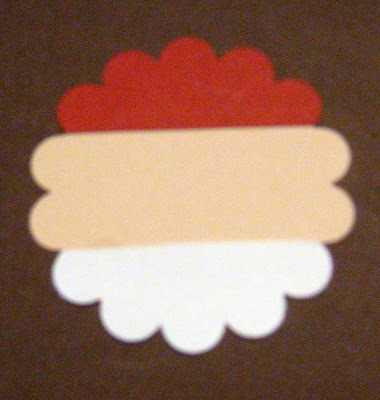 Then I got to playing with the punches and I had seen on some one's card that the small snowflake from this set goes well with the Boho Blossom punch 6 petal flower! Then, lo and behold, it layers great with the Snow Blossom punch! I got that punch for Christmas from the hubby a couple years ago and am just now using it for something for myself. And I splurged and used a rhinestone brad in the center of the snow blossom (Stop the hoarding now!) 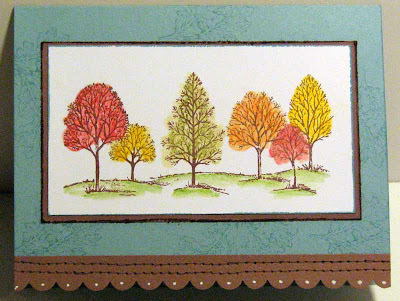 Stamped the KK snow blossom with the Swirled tree, inked edges of the punches with markes in as close a color as I could. I even stamped on the inside. I think it is a great finishing touch without a lot of effort. Has it really been 10 days since I posted anything!? Wow, I'm getting behind! 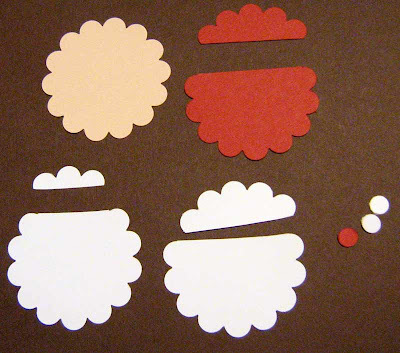 Well, I thought you might like to see what we are making tonight at Stamp Club. Elli won't be coming, she is being deployed to help in Houston. Good luck and stay safe Elli! We'll do your projects for you while you are gone! 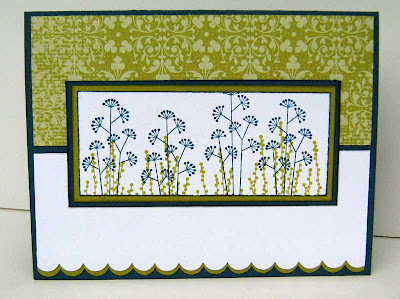 Ok, Heather had made a comment to me about how someone else had made some simple, yet beautiful cards, with patterned paper. It made me realize that I don't use it much in our projects and I thought I would try to incorporate some in each project we do this month. Don't expect it to become a habit though, LOL! 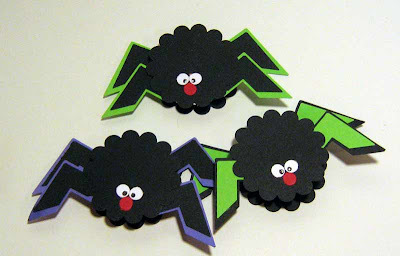 This is the Halloween page we will be doing, aren't these papers fun! I used the new Ghostly Greetings paper that I just got about a week ago. This is inspired by ReginaBD here. I just really thought it was a lovely clean design. This stamp set is on sale this month for 15% off! This is the girl version, so cute! 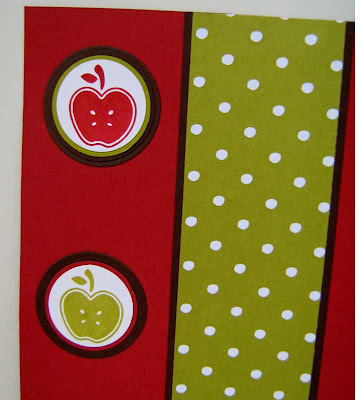 The patterned paper is 2 sided, so everyone gets both prints at once! And I had to use this adorable little hugging bear. At least that what it looks like he is doing to me! And he is on sale this month, too! I can't wait to share all of these projects with everyone today! 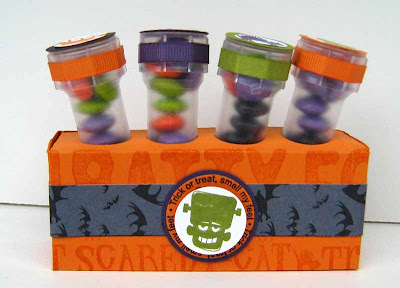 These are inspired by test tube holders done by Lisa S on SCS . I got to thinking about how I could do this with the empty syringe holders that we throw away at work. So this is my fisrt attempt at it. I think I must have scored something a little crooked but I still think it turned out cute! 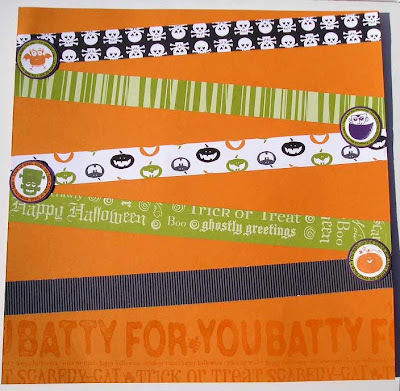 I also got to use some the new halloween paper from SU called Ghostly Greetings, lots of great print is that pack. I will forever regret not getting last year's Halloween paper that had purple in it too. So the dimensions of the back piece are 7x3, scoring at 1 1/4" on 2 short sides and 1 long side. For the front piece it is 7x 4 3/4. 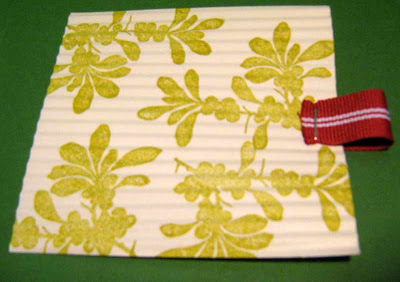 Score sides at 1 1/4". then from bottom score at 1 1/4, 3, and 4 3/4. 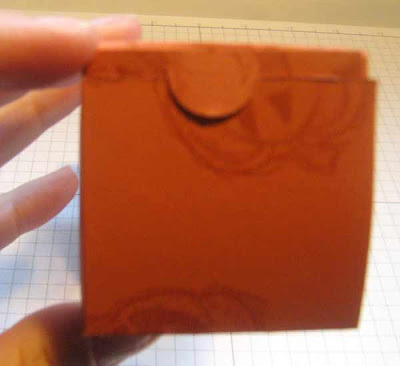 I also used a 3/4" circle punch for the holder holes because 1" was too big. 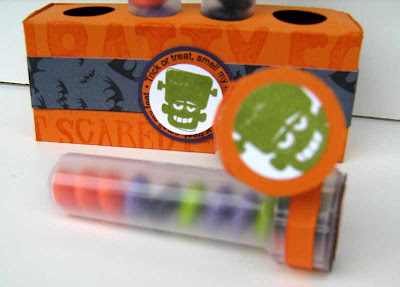 Here is a close up of the tube with M&M's in it, and the top of another tube leaning on top it. Cute huh!? Let me know what you think. Does the thought of using a syringe case freak you out? Or is it a neat new way to recycle? 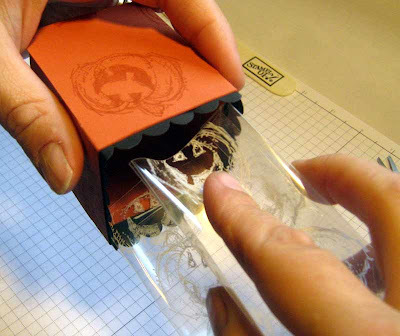 Better instructions on top closure for the acetate box. I thought I would do a photo tutorial quick. Well, quick didn't happen! My camera batteries died half way through and I had to wait for the batteries to recharge before I could finish it! Now, these are the instructions for the adapted top closure only! The rest of the tutorial is available here. 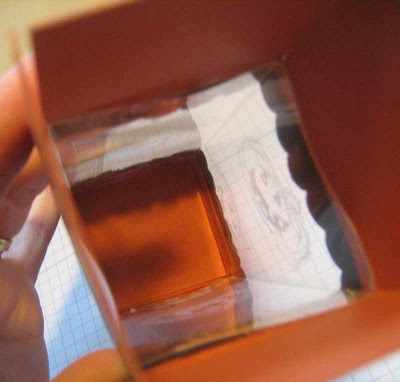 First, glue little flap to form the square or cube. Then apply glue to all sides, above the score lines. I used Tombow Mono Multi . 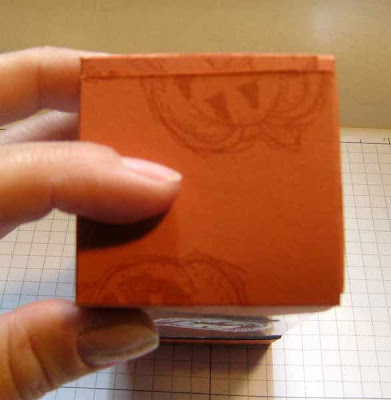 Next, squish your box a little and slip inside the cardstock cube., Ack! I just realized I stamped my images upside down on this piece! So the cardstock pumpkin should be the other way, oh well! Make sure your acetate edges are evenly just below the score lines so that your top will be on straight. 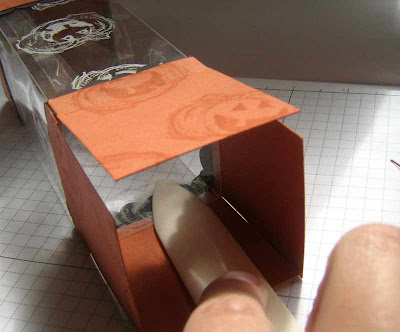 I then laid the box on it's side and used my bone folder to rub the acetate and cardstock together until the glue held well. Now, find the side that you want to be your front of the box. Trim about 1/8" off the front flap with paper trimmer. Turn this side to be facing you. 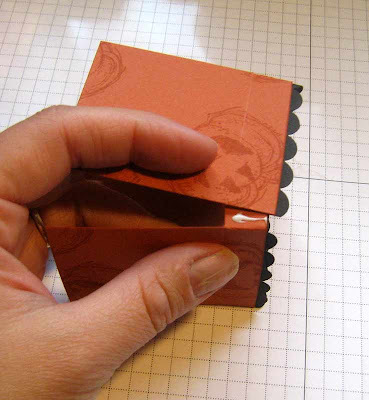 Fold right side flap in. Fold left side flap in. 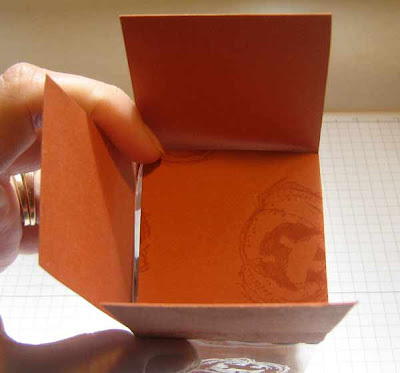 Fold front flap down. Now, note which edge of the left flap corresponds with the back edge of the front flap. 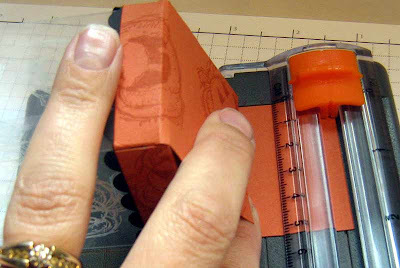 Then use slip punch centered on that edge. Now the top flap will tuck into the slit and hold the top closed!